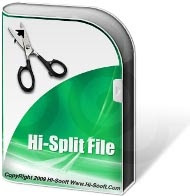 We have come across many file compressor tools and file splitting tools just to reduce the file size for easy upload and easy file transfer with constrain storage capacity, and along with it here is a new splitting tool called HiSplit. Hi-Split File is a program that can split a file into smaller chunks and also join these chunks to restore the original file. Hi-Split File is very simple, small and easy to use. It does not need any installation. After download and launch select Split option, then browse to select file which is to be splitted, select file size (MBs/KBs) finally get your output files by hitting the start button. and the same for merging the file as well. Compatible: Windows 7, 98, 2000, XP, VISTA. And added to it if you want to combine contents of multiple text files into one single text file, make use of Text File Joiner which does it in a simple and easy way, content can be presented in order as you like as well. Likewise large text files can also be splitted with Text File splitter.